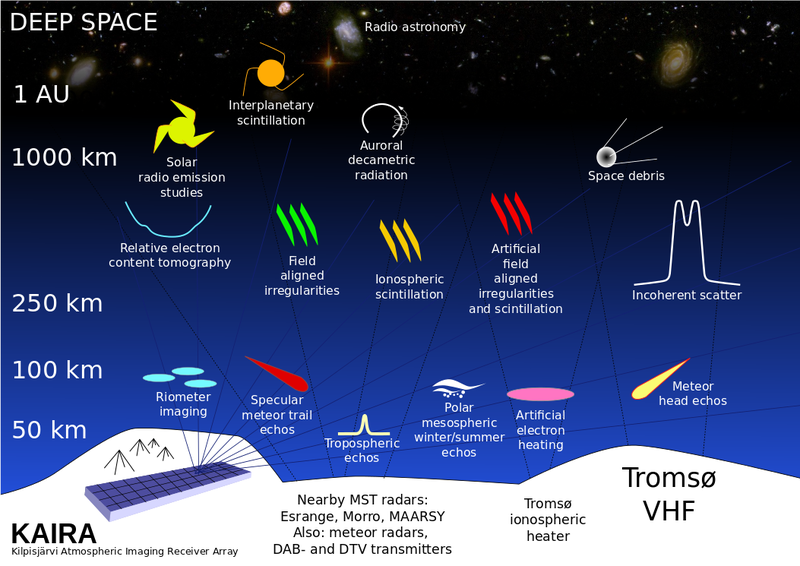 Kilpisjärvi Atmospheric Imaging Receiver Array: Ionospheric "Scintillation Arcs"
Compact radio sources twinkle (“scintillate”) because of variations in density moving around in the interstellar medium, the solar wind and the Earth's ionosphere, in exactly the same way as the visible stars scintillate due to the Earth's atmosphere. This scintillation has been studied for many years and is used as a way of probing these density variations and gleaning information about, for example, the density and velocity of the solar wind. 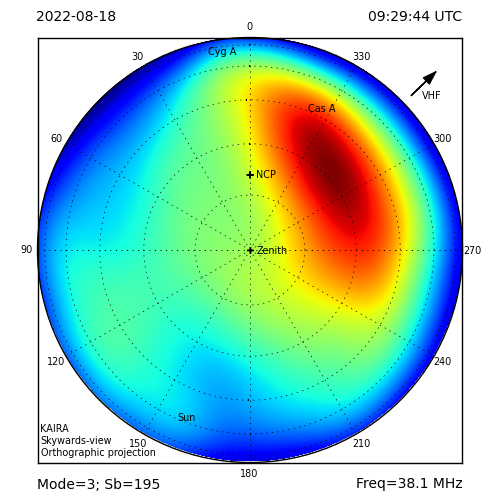 With KAIRA we have been observing ionospheric scintillation since operations started in 2012. When viewed as a time series, the scintillation manifests itself as rapid variations in received intensity. If the received signal is also split up into a number of frequency channels across the available bandwidth, the time series' for each channel can be stacked and plotted in a dynamic spectrum which shows how the pattern of scintillation varies with both observing frequency and time. In modelling the scintillation, we often assume that the signal is scattered by a “thin screen” of density variations (imagine an irregular grid through which light might be diffracted), moving at a certain velocity relative to the radio source. The scattered waves then interfere as they travel further from the screen and the resulting interference pattern is what we receive as scintillation. Multiple thin screens along the line sight can be used to model scattering due to a thicker medium. Now imagine pairs of waves being scattered by the thin screen: Each pair of scattered waves has a Doppler shift due to the movement of the screen and a time delay between them due to the different path length that each wave has likely followed. A “map” of these Doppler shifts and time delays between every pair of scattered waves can be formed by taking the so-called “secondary spectrum” - effectively the 2-dimensional power spectrum (squared amplitude of the 2-dimensional FFT) of the dynamic spectrum. When this analysis is applied to pulsar observations to study scintillation in the interstellar medium, a clear arc structure termed a “scintillation arc” (first discovered by Dan Stinebring in 2001), is often seen. Over the years this has proved an invaluable tool for probing the interstellar medium. Now, for we believe the first time, scintillation arcs have been found in the secondary spectra of ionospheric scintillation seen in observations of Cygnus A taken using the KAIRA. It is believed that these also represent the first such broadband (relative to the observing frequency) observations of arcs due to any scattering medium and also the first found using LOFAR hardware. These results have now been written up in a paper recently submitted. 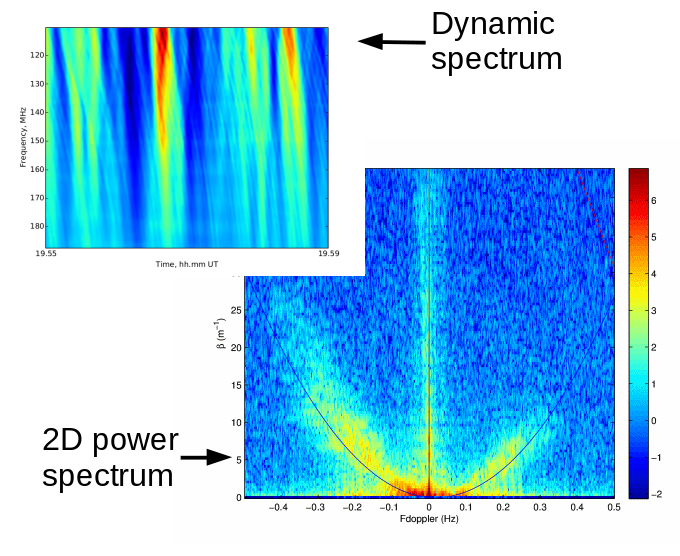 The image shows an example segment of dynamic spectrum and an example secondary spectrum, with the x-axis being Doppler shift and the y-axis being a parameter equivalent to time delay.